The new Hyundai Santa Fe SUV has evolved nicely. 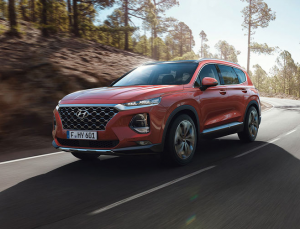 Prices start in Ireland from €42,245 and for the cash you get a seven seater that looks rugged yet has enough design detail to take on the Germans at their own game. 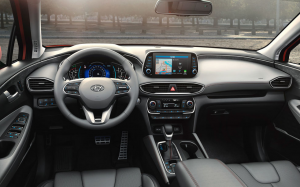 Korean car giant Hyundai/Kia is a serious global player and this is down to many factors but the main one is it is a one stop shop. Hyundai controls the whole car making process. It uses its own steel right through to headhunting the best German engineers and designers to compliment its indigenous workforce. In Ireland over a few brief years Hyundai has become a go to brand for those seeking value for money. More recently sharp styling has come to the fore replacing the more curvy Hyundais of old. 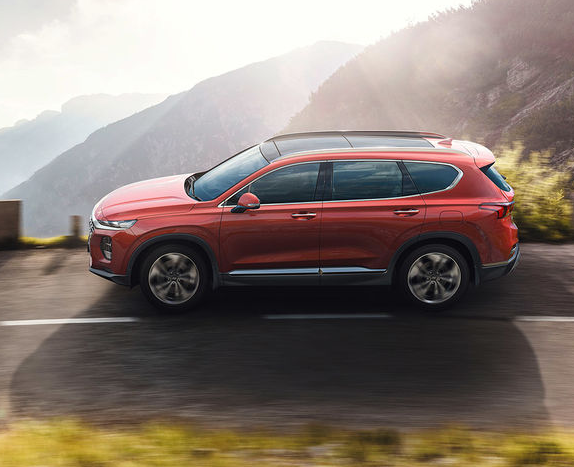 The exterior is right on trend and can stand proud next to the current crop such of seven seaters such as Peugeot 5008, Nissan X-Trail and Volkswagen Tiguan All-Space. 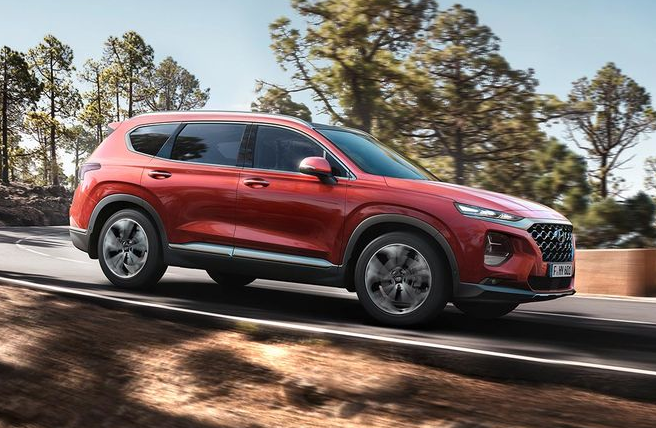 The new Santa Fe is more boxy than the original and quite business like. A new grille and light layout dominate the car when viewed head on. The same new design language from the excellent little Kona can be seen clearly. Side-on the Santa Fe could be any mid-sized SUV while at the rear the Hyundai family look is more obvious. Inside the comfortable cabin there is an air of premium to the car although materials fall short of Audi and BMW standards they aren’t far off. A layered dashboard shows hints of BMW and the centre touch screen screams of Audi influence. The driver gets a TFT digital 8 inch display that looks quite smart. My test car was the top of the range model and fully loaded with impressive features like a HUD (head up display) , wireless phone charging and panoramic opening sunroof. Being a seven seater the cabin is the focal point. The rear two individual seats pop up with a pull of a strap and when down create a large flat floor boot area with 625 litres of space. The middle seat bench is split and adjustable fore and aft and the seat backs can be adjusted too. Up front my leather seat was electrically adjustable and heated also. A heated steering wheel added to the premium quality of the cabin. 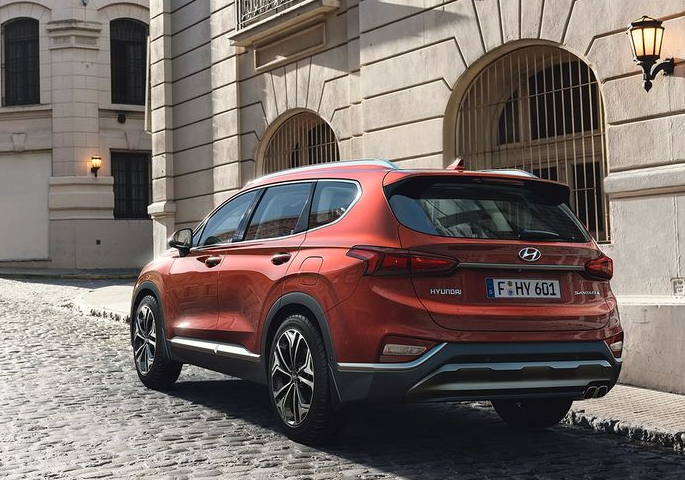 A 360 surround view camera system made any maneuver that bit easier and the new 8 speed automactic transmission with paddle shifters made the Santa Fe very easy to use daily. 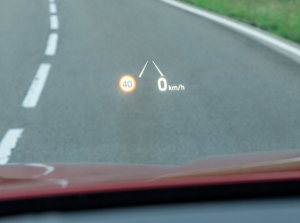 A host of ADAS driving safety aids are available such as adaptive cruise control, lane departure warning and lane assist plus. Other convenience features added to the pleasant experience like auto headlights etc. and cyclist friendly door operation. Power for the Santa Fe comes from its revised 2.2 litre diesel that now has uses AdBlue. Front wheel drive AWD versions are available. Various drive modes can be selected that include Eco (self explanatory), Comfort (delivers up to 35% rear wheel drive bias), Sport (quickens responses) and Smart, that basically reacts to your needs at the time. The AWD system uses Hyundai’s HTRAC system. This adjusts power distribution and you can select a display on the driver’s panel that will show how the power is being distributed between wheels. In normal conditions AWD cars drive in front wheel drive to reduce fuel consumption. With AWD versions you can press a button to lock on 4X4. The model range for Ireland starts with the FWD Comfort Plus from €42,245. The FWD Executive Plus is priced from €45,245, in AWD for it rises to €47,245 and add automatic and it costs from €51,245. Premium Plus AWD Auto is the range topper and it starts from €57,745. 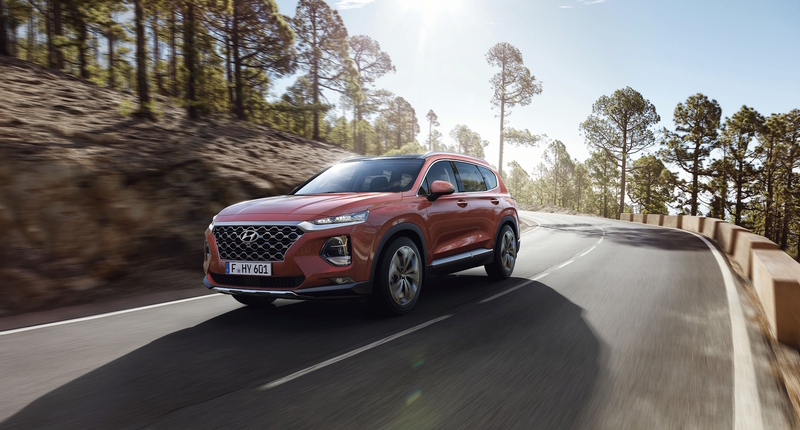 On the road Sante Fe feels substantial and apart from an initial growl when moving off in the automatic, the SUV cruises well. Big alloys will add a little to interior noise on poor surfaces but overall the Santa Fe feels quite classy and so it should at the price.